Istanbul (Fuzzy Logic): "The fact that we got that kind of support is kinda touching - you've done the impossible, I'm speechless." Doove: "… after eight, I finally got it right." 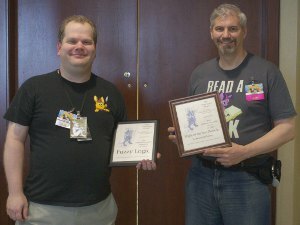 The Ursa Major Awards are intended to feature the "best" furry fandom has to offer, as decided by the fans – similar to the Hugo Awards for science fiction & fantasy. This year, no ALAA's Choice Award was presented. Starting the previous year (2012) Anthropomorphic Literature and Arts Association introduced the option to present an Award for an anthropomorphic work that has been judged to be outstanding for the year, but has not been selected by the community during the voting process. The ALAA's Choice Award, unlike the Ursa Major Awards, is selected by a vote among the fifteen members of the Anthropomorphic Literature and Arts Association. This year's Ursa Awards were featured prominently on WikiFur and Flayrah, both of which were nominees. However, turnout at Anthrocon was poor; dealers were closing for the day, and others were eating. While nominations for next year's Awards have to wait until January, submissions to the ALAA's Recommended Anthropomorphics List has been open for suggested additions since around May 8. For what it's worth, I put "Albert of Adelaide" on my nomination form, and I was also sad to see it didn't get enough to make it through to the Voting Round. Edited to Add: Howard L. Anderson has apparently completed a second novel titled "TJ" (the raccoon from "Albert of Adelaide"), but no news yet about if/when it will be published. The most tragic part of this? While Kyell Gold withdrew himself to try and bring legitimacy to the awards, to quell all these nay-sayers that it was not his awards, to try and improve Ursa's legitimacy to the fandom. The effect seems to have been the opposite. There were less voters this year than two years prior, and no doubt a good deal of that 37.5% of less voters was because of Kyell Gold's absence. At this point I think it's clear. If Kyell does care for the Ursas I think he should stay in them and to hell with the haters, if they hate him so much they should come in and vote for the best work that isn't his. At least then, hey we got more voters... they may be voting for the 'wrong reasons' but what popular voting scheme (or even 'elitist' voting scheme) doesn't have that? Unfortunately this is one of those unknown correlation/causation situations. He encouraged his readership to nominate and vote in his blog; isn't that a good thing? We'll see when the category numbers come out (if they do this year). Just cause someone says do something doesn't mean their fans are going to do it. One has very little control over their fanbases. A lot of internet celebrities have to keep telling their fans not to go attacking people who do similar things they do--- they do it anyway. I am noting that Kyell certainly had the best of intentions doing what he did, however I think it didn't do what he wanted to accomplish. If people aren't voting it means that they have given up on their vote mattering, or they don't have anything they feel worth voting for. I mean, if Dawngaurd is the best furry game of 2012, I guess I'll call Twilight the best furry novel of all time... I mean, they named a pony after it, it has shallow women characterization, and it has vampires (since Dawngaurd apparently proved those are furry), so it'd certainly quality. Insulting? Indeed. As this winner is to furrys, Pokemon fans, Humble Hearts, and the awards themselves. This is coming from someone who was like 'okay' with Avatar which is Crossaffliction's Ursa peeve. I wanted Dust to win as well. Not so much due to the content but that so much of it was accomplished by one person! Was unpleasantly surprised on both ends. Someone was going to say it. May as well now. I guess I owe you two apologies now (I'm pretty sure you know what the non-Ursa Majors one is), but funny you should mention my name, because I was the one that sent in Dawnguard to the Recommended List. I didn't vote for it, though; I nominated the two Epic Mickey games and abstained from the final ballot (I hadn't actually played anything except Pokemon, which I didn't consider furry enough; and I recommended Dawnguard as a makeup for Skyrim, not as an awards player, so I figured it was okay to recommend, just not vote). Anyway, I'm assuming the votes were for the Khaijit and Argonian playable races (I know that's why I recommended it, anyway) rather than anything to do with the storyline. I kind of figured it was something to do with just being Skyrim, and that wasn't around in 2011 for voting (then again 2011 had an extremely solid lineup of games). There are still Kajhitt and Argonians I suppose, though the expansion didn't really add any more furriness than the original had already. Could never have predicted it was you who added it to the recommendation list. That's hilarious really. Opps. Not to big a deal, I guess it just shows that maybe I SHOULD finish up that Dust review and post it. I didn't play it until it came out on PC, and by that point the votes on the Ursa Major were closed. I think there might have been a smidge more werewolf stuff added in Dawnguard (apparently you can't have vampires without werewolves), too, if you that makes you feel better (though it feels weird to be a Khajiit werewolf). Dust probably still should've won; and I expected a Pokemon win, too. Skyrim would have been a good choice last year; it was about talking dragons in the main storyline. That is true, been so long I forgot about the talking dragons. If I consider it the whole of Skyrim VS Pokemon VS Dust it's not so bad. It's more the expansion thing that kind of tweaked my muzzle a bit. I got 3/7 of my voting choices. I'm still not happy how we rate a game where only a fraction of the characters are furry as more deserving of an award than a 100% furry game made by furs but I suppose that's the problem with any sort of vote. Popular and critical acclaim are not the same thing. If they were FA wouldn't have won an award when the site itself hasn't accomplished anything. im kinda wondering how Brave took home a win, havent seen the movie personally tho what i have read about it theres nothing really furry about it.. i think dust really should have beat it out imo..
Year after year, and still no coverage of European based comics (paper and digital). Angoulême and the Tournesol (France), the Concurso mundial del comic, ComicBarcelo, ImaginaMalaga, and ExpoComic (Spain) allow and consider American based entries (Sabrina Online and Lackadaisy were well deserved and surprise entries this year, with Usagi Yojimbo, Omaha the cat dancer, and Digger by Ursula Vernon in the past). With US and Asian entries only (except if they are translated into English, e.g. Blacksad), it is really becoming not worth even trying to promote it to friends. Pair it with its almost lack of updates and announcements, specially in European forums (leaving it to sites like Flayrah make sure it gets noticed, almost at he last minute, and the reaction is always "oh, it's on?" ["a decrease of about 37.5%", gee, I wonder why]), it's quite not something to look forward too or bother. Starting to feel like a furry Hugo (the award, not the funny animal comic). "Add it on the suggested list!". Every bloody year. So much of a great possibility, so poorly handled. The Ursa Major Award is not restricted to any locality or language. However, it is unrealistic to expect French- and Spanish-language works to enjoy placement in a popular award when the majority of voters are solely English-speaking - and judging by convention returns and visits to fandom websites, will continue to be regardless of promotion in other venues. If you wish to see them recognized, it might be best to establish a juried award with a group of voters qualified to consider such works. Post withdrawn at the request of the author. We're trying to spotlight everything; until recently, Flayrah rarely spotlighted something like Rio or Rise of the Planet of the Apes. Dronon's the foreign movie guy, mostly, though I did review a Korean movie, and I'll have a review of a South African movie eventually. A monthly or so list of foreign comics of furry interest would be a decent feature; submission is easy if you want to do that (and I say you should). It would be a great complement to the Previews list. also, submit to the Recommended List; I turned in Dawnguard on a whim, and it ended up winning (I've already apologized for that). I already explained my theory for the decrease in voter turn out. It's not really because Europeans were given the cold shoulder (as you mention, that was occuring long before this year and there was no major complaining about that element or movement that would cause such a large decrease). Mainly Kyell Gold took his works off the nominees because he had felt he had won enough and wanted to give others a chance. Though he did ask for his fans to still participate, it HAD been awhile since he announced (if all those who enjoy his works read his desire at all, seeings as just because you read a man's books doesn't mean you read his blog.) That is a major change, enough of one to cause a mass movement. As I said, the numbers will show if that's the case, he had 311 vote #1 for him last year. Clearly while the Kyell Gold could be a factor, it doesn't seem like it can be the only one. So lets look to 2011's other features. It was an exceptional year and highly competitive. I mean look at the list of movies an no one could debate that none of those deserved to be there, look at the list of video games; same deal. This year? Hardly even close. We have "Brave" and things like "Skyrim Dawngaurd" to pad out the fact that it was a seemingly dry year. Here's the thing though, if you really want to rock the boat understand that only 1,113 even voted this time... so if you know like 200 Eurofurs who really want to push their stuff you should be able to get a nomination easily. Heck you could do a hostile takeover of the awards from Americans if you got the troops together. I mean, we're too lazy to get out and vote for Dust and have the foresight to wait until 2013 to nominate Skyrim: Legendary Edition, so why not at this point? I pretty much agree with Crossie and GreenReaper here, it's unrealistic to hope that obscure foreign-language works would get nominated for Ursas more often, much less win. I tend to have a foreign bias towards French stuff because I understand French, but am I going to try searching the Web in German, Spanish, Italian, and other languages I don't know? Probably not; someone with the language skills to do so would have much better success and efficiency than me. Personally what I find way more important is the Recommended Reading List that the Ursa site also hosts. ("Recommended" isn't so much a statement of quality, it's more like "Someone wanted to include it on this list".) It's a great place for the obscure and the foreign! Otherwise, there's also here, on Flayrah. Post a review, or post a newsbyte on the side, every little bit helps. May I point out that there have been reviews here as recently as April and May of “La Saga d’Atlas et Axis”, “L’Epee d’Arnenois”, “Sale Bête”, and vol. 1 of “Kairos”, in French, and other French-language books before that? Yes, I saw these after somebody mentioned that "La Saga d'Atlas & Axis" T1 and T2 had been reviewed here (got both copies from FNAC). But still a drop in the bucket considering the sheer amount of EU titles (comic, webcomics, indie, fanzine, graphic novels, digital [IOS and Android, e.g. anything carried by Ave and Zinio on these platforms]). But a drop is better than nothing. If you want to see non-American works here, review them, and nominate them. Do an article about the best ones. Offer to do fan translations so other people can read them. Unless people can read them, knowing about them doesn't do a lot of good.